Hello! It's GLOSSYBOX time! I cannot tell you how happy I am with this month's box. It focuses on a going back to school vibe. Does anyone see September as a sort of start to a new year full of fresh plans and fresh ideas? I am especially excited about the back to school edition as last month my box didn't arrive, thanks to my local post office. However, it was worth the wait as this little box is jam packed full of a mixture of full size products in addition to some travel sizes ranging from skincare, hair and even makeup. Apart from the wet wipes and Karl Lagerfeld lip liners, all the other items are new on my radar from brands that I have not come across. This self-foaming sheet mask bubbles to create a micro massage that cleanses the skin of impurities and blackheads. 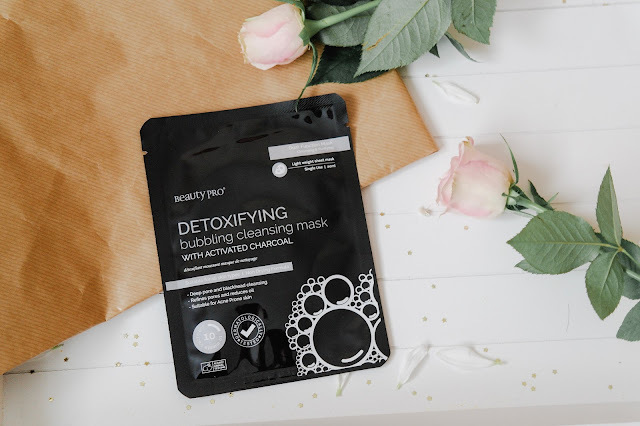 Utilising Activated Charcoal and a rich AHA complex created from Lime, Lemon, Apple, Orange and Grapefruit, this detoxifying mask is also suitable for acne prone skin. What can I say about this mask - Amazing!! Lately I have become somewhat obsessed with sheet masks, however a foaming sheet mask is something completely new to me and I have not seen something like this from any other beauty brand out there. I couldn't wait to try this and at first it did feel kind of strange when it began to foam on my face but it left me with beautiful, clean, radiant skin afterwards. The quality of the mask is shown by the results from the foam of the mask as it did not slide on my face and it kept foaming. For anyone out there who wants to try a sheet mask I would say for the great price, quality of the sheet mask itself and the great ingredients - This one is for you. A design with pockets so you can simply slip onto your fingers for better control. The innovative texture with micro scrubbers technology which is pretty perfect for a daily soft wash or for an exfoliating wash. I also think that it's pretty cool that they have a label with an indicator that fades to let you know when you need to replaced your mini scrubber. I am so glad that this one was in my GLOSSYBOX this month as my skin is breaking out and no matter what I try my makeup ends up slipping off my face after a few hours. I use my facial cleanser along with my exfoliating scrub and I have noticed a difference in my skin. I have consistently used this for a few days in a row it has helped that skin on the top be removed, leaving newer, healthier skin showing. The rough side exfoliates, the soft side helps rinse. There is nothing more exciting than trying out a new eyebrow product, brows are a big thing for me. I will not got anywhere without them. Ha. But it's important for me to make sure that my unruly eyebrows are tamed and filled. And I think that this Bang Beauty Eyebrow Cream may be a good one to try and put in my makeup routine. This eyebrow cream comes in a gorgeous looking box and inside a nice-looking glass pot which is complimented with a tiny angle-cut brow brush. The brow cream works well and lasts for a while. I like that it comes with its own tiny cute brush, even if its not the best one. The brush is soft but almost a little too soft for this type of application. This formula is light weight and creamy and applies soft layers that you can build to get your desire effect. Whether you was a subtle look or go all out and get more bang. 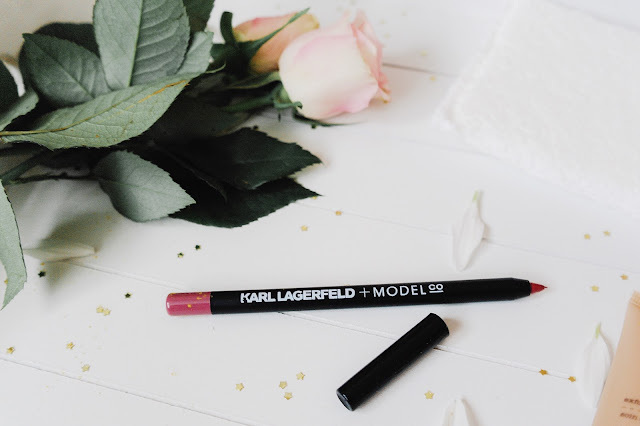 I am more than familiar with Karl Lagerfeld + ModelCo and in a nutshell it's a pretty great. But for those who don't know, Karl Lagerfeld is one of the world‘s most renowned fashion designers, and he has teamed up with iconic Australian beauty brand ModelCo to create the most exciting beauty collection of 2018. Karl Lagerfeld‘s vision and aesthetic, combined with the innovative quality cosmetics of ModelCo, has resulted in KARL LAGERFELD + MODELCO; a limited edition collectable beauty range. And this lipliner is a gorgeous shade. Now lip liners are not normally my thing, however if I do have time to get my lips done before the school run, I will have a good lip liners and either a subtle shade of lipstick or lip balm. I really love this one. The pencil itself glides on my lips and has pretty impressive staying power. A completely new brand for me and I can't say I have ever heard of Grow Gorgeous either. This scalp detox sound like a really good treat for my scalp and hair, unlocking the secret for hair regrowth.. Utilising plant-based actives and nourishing ingredients, the unique, cooling formula combines natural Castor Oil Beads, White Willow Bark extract and Pomegranate Fruit Enzymes to gently exfoliate the scalp, providing a deep, intensive clean that eliminates clogging impurities, product build up, dry skin and dandruff to create the ideal environment for hair growth. This scalp scrub needs to be used on wet or damp hair before shampoo. It feels amazing to use, and after a few minutes you get a minty, tingly feeling on your scalp. It removes all the build-up if you use it correctly. Everytime I use this my hair feels super duper clean for a lot longer, it has more volume, more shine, more bounce. It even dries quicker! Also I love the smell of it, it's the same as the 11-in-1 cleansing conditioner and the hair growth serum. It's really good for itchy scalps, build-up, and flat, dull hair. I really recommend this! Technically, not a beauty product, but most definately a beauty gem. It’s a product that is very practical and useful in your handbag. And seeing as I have a four year old that can get very messy these are more than perfect to use. Normally we like to keep a antibacterial gel at hand, but these are great for wiping away the dirt too. 7 comments on "GLOSSYBOX - September 2018: Back To School"
I’ve never tried GLOSSYBOX but these products look fab! this box looks incredible! i am loving that charcoal masks and treatments are coming back - they were great on my skin! This looks amazing! I can't wait to see how they change as we get closer to winter!